Whisk together the yolks and the sugar. Add the potato starch. Meanwhile, heat the milk in a pot with the vanilla bean. When the milk is boiling, remove the vanilla bean and pour the yolks and sugar mixture in the pot. Whisk the mixture until creamy. Remove the pastry cream from the heat and let it cool in a bowl covered with cling film. Grind the hazelnuts. Add the confectioner’s sugar and grind the mixture until oily. Leave the paste in a glass container. Toast the almonds in a pan for few minutes. Add the sugar and the water and continue to heat until the sugar sticks to the almonds. Let the almonds cool. In a bowl, whisk the eggs with the sugar. In another bowl, mix the flour, the cocoa and the baking powder. Fold the dry ingredients in the mixture and mix until smooth. Let the cakes rest. Then, carve out a 24 cm circle from each sponge cake. Melt the chocolate in a bain-marie. Add the butter and mix. Blend the almonds and add them to the chocolate. Pour the mixture in a 24 cm baking pan (with openable circle) covered with baking paper. Put in the fridge for half an hour. Put the isinglass in a bowl of cold water for 15 minutes. Melt the chocolate in a bain-marie. Whip the remaining cream up. Pour the pastry cream in a bowl. Melt the isinglass in two tbsps of warm cream and add it to the cream. Fold the chocolate into the pastry cream mixture. Add the whipped cream and mix softly. Put the isinglass in a bowl of cold water for 15 minutes. Pour the pastry cream in a bowl. Melt the isinglass in two tbsps of warm cream and add it to the cream. Whip the remaining cream up. Fold the hazelnut paste into the pastry cream mixture. Add the whipped cream and mix softly. Put the isinglass in a bowl of cold water for 15 minutes. In a pan mix the sugar and the cocoa. Heat the mixture up. Slowly add cream and water. Mix until boiling. Add the isinglass and let the glaze cool. Take the chocolate crust from the fridge. Pour half of the chocolate Bavarian cream on the crust. Cover with one circle of chocolate sponge cake. Wet the cake with sugary water. Pour the hazelnut Bavarian cream and put the “half cake” in the fridge for half an hour. Take the cake from the fridge. Cover with the second sponge cake. Wet the cake with sugary water. Pour the other half of the chocolate Bavarian cream on the cake and put the cake in fridge for two hours. Take the cake from the fridge. Remove the openable circle. Pour homogeneously the glaze on the cake. Leave the cake in the fridge for few hours. Finally, enjoy it! Separate the yolks from the whites. In a bowl whisk together the yolks and the sugar. Add the mascarpone and mix until smooth. In another bowl, whip the whites and fold them in the cream. Pour a layer of cream and nutella in a rectangular pan. Make a layer of savoiardi soaked with coffee. Alternate a layer of cream and a layer of savoiardi making sure that the top layer is done with cream and nutella. Sprinkle cocoa to decorate. Keep in the fridge for 4-5 hours before serving. Preheat the oven to 180° (350 F) and butter a round 22 cm (9 inches) round baking pan. Sprinkle the oats on the pan. Melt the dark chocolate and the butter in a bowl placed over a pan of simmering water. Remove from heat and stir in the stevia and the vanilla extract. Beat the eggs in a separate bowl and add to the mixture. Fold in the oat flour and the cocoa nibs. Pour the batter in the cake pan and bake for 30-35 minutes. Allow to cool completely. Then, remove the cake from the pan and serve upside down. Preheat oven to 190° (375 F). In a bowl mix the melted butter, eggs, buttermilk and vanilla extract. In another bowl whisk together the flour, cocoa, sugar, baking powder, baking soda, salt and then add the chocolate chips. 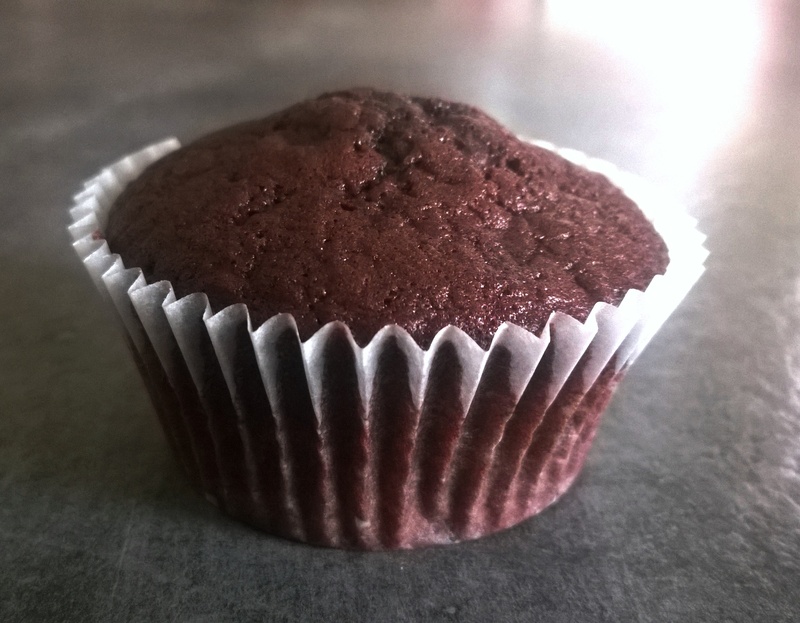 Fold the wet ingredients in the dry ones, do not overmix the batter! Bake the muffins for about 20 minutes about 20. Remove from the oven, cover them and let them cool. Thanks to our friend Alice who brought this original chili pepper powder from Turkey! Break the chocolate into small pieces. Boil the cream and add the chocolate until melted. Let the ganache cool and rest for 3 hours. Fold the chili pepper powder into the ganache. Make little balls, put them on baking sheets and keep in the fridge for half an hour. 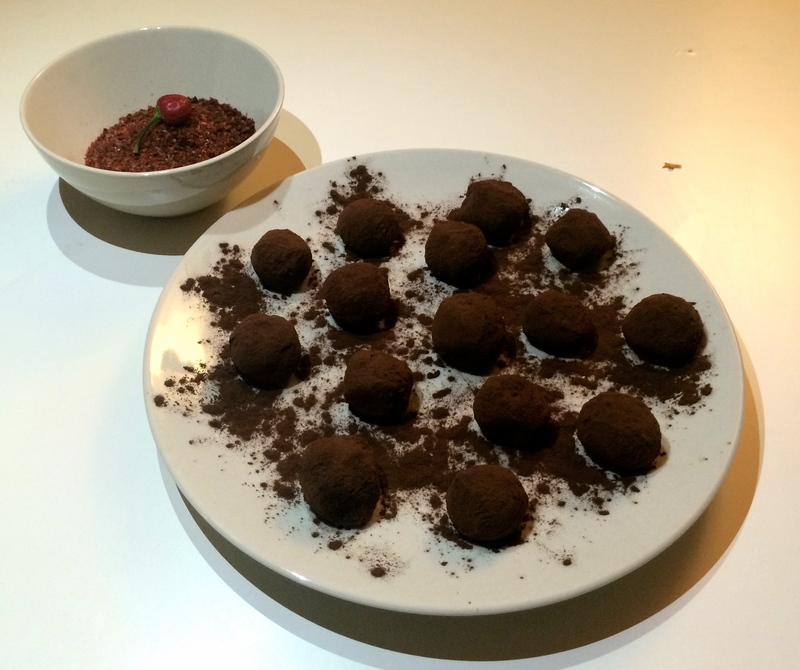 Roll the little balls in the cocoa powder, put on a plate and serve.